It is a small airport, likely refreshingly uncrowded, relatively quick & easy, and likely the only one you'll need on Maui. In a nutshell: It is a small airport, likely refreshingly uncrowded, relatively quick & easy, and likely the only one you’ll need on Maui. Minuses: It is an airport. Kahului International Airport (OGG) is the main airport for Maui, and unless you have some significantly unusually compelling reason, it is where you should fly in no matter where you stay. OGG is a very small airport, with just two runways, and limited flights. 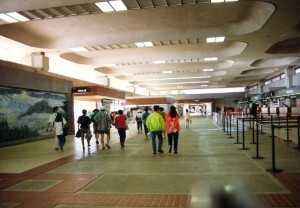 It is an open-air building design, that greets arrivals with the sweet Hawaiian air as soon as you exit your plane. Many people comment upon their first impression of Maui being that of deplaning into the luscious atmosphere of Maui. Anyway, Kahului airport (just like the rest of Maui) is mellower than mainland counterparts. We still have TSA and all the security procedures. What we don’t have is obscenely long lines. Parking is also very convenient. Just to give you an idea of how quickly you can process through the airport, when I fly alone (read: no kids) I will arrive at the airport an hour before my flight, and almost always be waiting for about 45 minutes of it at the gate. It would take unusual circumstances for you to be much more than a half an hour from curb to gate. Also, when flying back to the mainland, you should note that agricultural products which were not produced and certified pest free by State approved vendors are prohibited, and your luggage will go through x-ray and hand inspection specifically for agricultural products before exiting the state. Facilities: International Airport although shopping & food options are minimal. Kapalua-West Maui airport option is often a very attractive alternative to those staying in West Maui. Flights from Honolulu are not typically more expensive than Kahului, nor is rental car a problem. It can really come in handy when paired with the ferry to Lanai. You can easily return your rental car in Lahaina and not be faced with a logistical nightmare. The information above is simply wrong.